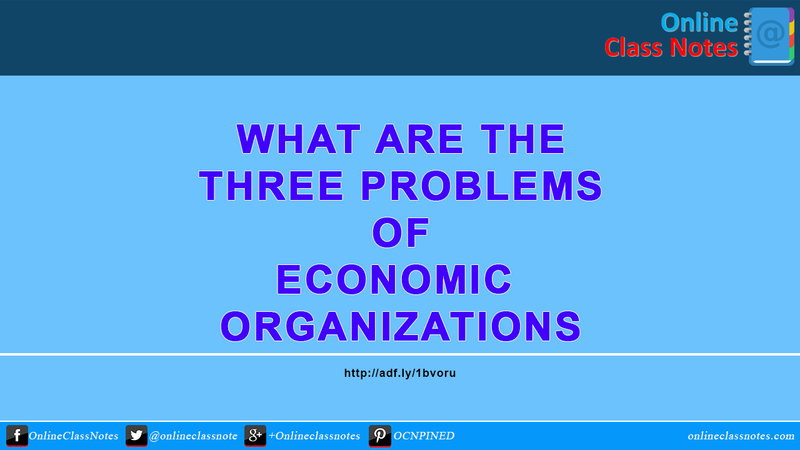 What are the three problems of economic organizations? How can the three problems of economic organization be solved in free and mixed economics? What commodities are produced & in what quantities. For whom goods are produced. Description and solution to these problems in fee and mixed economies is given below. A society has various needs and wants. But the resource it has is always limited. So to produce one, it has to leave another. Also, the quantity is a matter. That is, the production of a commodity may low down another commodity’s production. So, it is a problem, that using the limited resources what to produce and in what quantities. The society must have to consider the most obvious needs of its member to produce or to make the best use of the resources. In free economy, price mechanism is used to solve that problem. Price mechanism is a way that includes thinking about supply and demand, and the decisions which are taken get based on it. In this case, those commodities are produced for consumers who are ready to pay and the payment will cover at least the production cost. Then the quantity of the good is selected both on the resources and the demand. In mixed economy, the government has got some hands over the production of goods. That’s why though one has got enough resources and demand, he can not produce the thing in the quantity and with the price he wants. The demand and supply along with the necessity gets importance here. How to produce refers to the technique that is necessary to produce the goods in the best way. The best way depends on the production cost, use of resources etc. Each society has to find out ways to produce a commodity in low production cost and resource saving. As the resources are limited, if these are used in much amount to produce a commodity, it will become less to produce another. So the society or the economy will have to find out the best way to produce a commodity which will low down the production cost, will use less resources, electricity, man power etc. In free economy, the goods are produced by keeping many things in mind. Before going to factory, the demand of the good and the possible amount which may be paid gets the importance. The production cost is also very important. For good business, it is necessary to keep the production cost low. In free economy, by price mechanism, the production of goods is a matter related mainly with the production cost. In mixed economy, the production of a good is a matter controlled directly by the government. How the goods will be produced should have to be sound by the government view. Mainly the price mechanism gets modification by the government in that case. For whom to produce is a problem of distribution. No society can produce a commodity as much as its peoples need. So, they will have to find ways to distribute the production. Though they can not satisfy all, but at least they will have to try to distribute. This also has to be noticed, that all kind of goods are not for all. Except the fundamental goods or necessities, other goods get targets to whom they will be distributed. In free economy, one can produce goods for anyone he wants. That means one can target a particular section of society to sell his products. That means, the buyer will be the one who will be able and willing to pay for. In mixed economy, the targeted section of society gets some modifications. Here, the government can raise his voice against the production of ones. If a product is for all, then it should have to be for the majority buyers. This is the process at all. But sometimes the production cost of a product gets too higher that the price can not be low down. In that case, the government raises funds from rich by taxation etc and redistributes to the poor by subsidies, welfare payments etc.